2006- 2009. Research assistant – ANR EcOrEn project " Ecophysiology of Endophagous Organisms ". IRBI (France). The nutrition hypothesis states that galling and mining, two major forms of endophytophagy in insects, provide enhanced nutrition over other external-feeding modes, and allow endophagous organisms to avoid major plant defences. 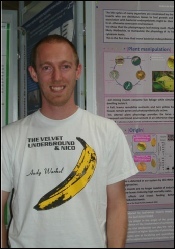 This behaviour can also be reinforced by manipulating the plant physiology and leafminer insects have been shown to create an "optimal" nutritional micro-environment through cytokinin production by their endosymbiotic partners. Our results clearly show that leafminer insects trigger host plant physiology modification through an unexpected association with cytokinin-producing endosymbiotic bacteria. 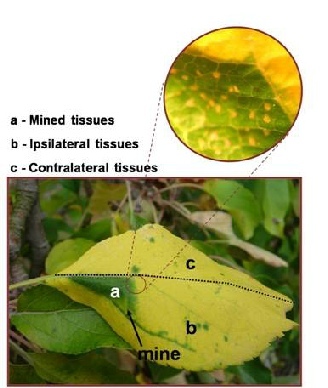 This plant physiology manipulation induced by a large accumulation of cytokinins in the mined tissues is responsible for the preservation of functional nutrient-rich green tissues at a time when leaves are otherwise turning yellow ("Green Island"). In Fall, leaves remobilize nutrients and turn yellow but mined tissues remain green and photosynthetically active. Giron, D., Kaiser, W., Imbault, N. & Casas, J. (2007). Cytokinin-mediated leaf manipulation by a leafminer caterpillar. Biology Letters (doi:10.1098/rsbl.2007.0051).